Fluorescence of many fungi is noted when H&E stained sections are examined under a fluorescent microscope. 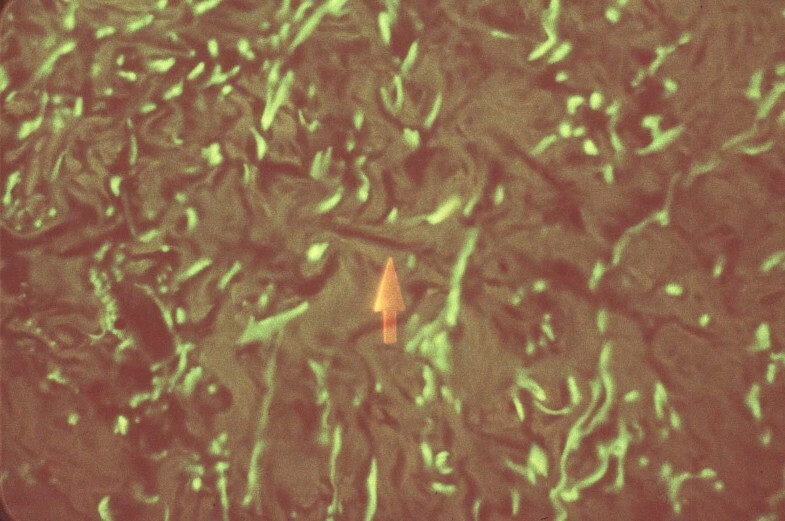 In theory, this phenomenon could aid in the diagnosis of cutaneous and disseminated fungal infections without the delay associated with special stains. 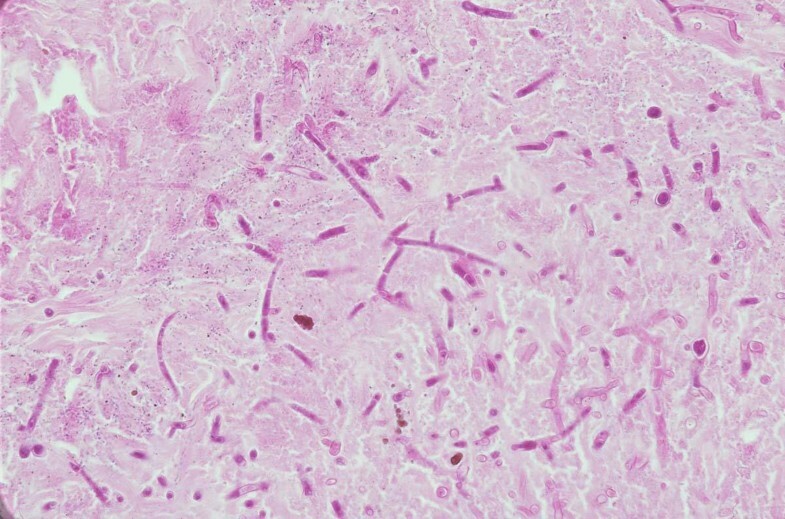 Seventy-six cases of superficial and deep fungal infections and 3 cases of protothecosis were studied to determine the clinical usefulness of this technique. In most cases, fluorescence was noted, but was not intense. Fluorescence of fungi did not correlate with the age of the specimen. In most cases, organisms in H&E stained sections were more easily identified with routine light microscopy than with fluorescent microscopy. This report suggests that in H&E stained skin specimens, fluorescent microscopy is of little benefit in the identification of fungal organisms. Many pathogenic fungi have been shown to exhibit fluorescence when H&E stained tissue sections are examined under a fluorescent microscope, and it has been suggested that the technique is useful in the identification of deep fungal organisms in tissue. The present study was designed to determine whether the fluorescence of fungi provides clinically useful information. Seventy six H&E stained sections from superficial and deep fungal infection and 3 cases of protothecosis were examined using a fluorescent microscope. No immunoreagents were used in processing of the specimen. All specimens has been preserved in formalin and processed, embedded, sectioned and stained in a routine manner. All were examined with an Olympus Provis microscope with a fluorescent light source (334 and 365 nm) and dichroic mirror with filters (DM-40 – DM 455). The specimens ranged widely in age from a few hours to more than 20 years. Most organisms demonstrated at least weak fluorescence. Organisms that rarely demonstrated fluorescence included organisms of chromomycosis, sporotrichosis and aspergillosis. The single cases of tinea nigra and blastomycosis studied did not exhibit fluorescence. Half of the cases of cryptococcosis studied did not exhibit fluorescence. Invasive phaeohyphomycosis varied from strong focal fluorescence to weak focal fluorescence. The degree of fluorescence did not appear to correlate with the species of pigmented fungus. Phaeohyphomycosis was more easily identified with routine light microscopy in H&E stained sections. Fluorescence was most prominent in cases of superficial dermatophyte infection (Figures 3 and 4) and protothecosis. Even in these cases, the technique was of limited help in identifying fungi. 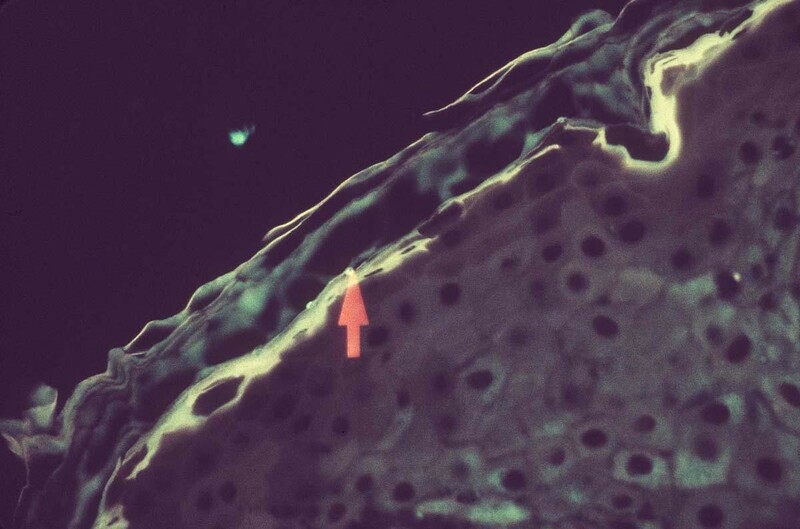 The only case in which fluorescence was remarkably helpful in identifying the fungus was a single case of Majocchi's fungal folliculitis (Figures 5 and 6). All cases of candidiasis, tinea versicolor and onychomycosis studied exhibited strong fluorescence of the stratum corneum that overshadowed fluorescence of the fungi. The results of the study are summarized in Table 1. Aspergillosis: oraganisms clearly seen in H&E sections. Aspergillosis: Fungi are less visible with fluorescence microscopy. Several reports have suggested that fluorescence of fungi in H&E stained sections examined under a fluorescent microscope could result in diagnosis without the need for special stains. The results of this study suggest that with few exceptions, fluorescent microscopy is of little benefit in cases of skin infection. Some cases of dermatophytosis and protothecosis exhibited strong enough fluorescence that the technique could be helpful, but even in these cases, fungi were generally not visualized at scanning magnification. Although cultures were not performed in any of the cases of dermatophytosis, the clinical presentation of each case suggests that the organism in question was most likely Trichophyton rubrum. An interesting observation is the strong fluorescence of the stratum corneum noted in all cases of tinea versicolor and candidiasis. This feature was never seen in dermatopytosis. Further study will determine if fluorescence of the stratum corneum is helpful in distinguishing dermatophyte from yeast infections in skin specimens. The lack of sensitivity of fluorescence microscopy noted in this report is at odds with the results of prior reports. Margo reported a case of periocular blastomycosis initially misdiagnosed clinically and histologically as squamous cell carcinoma . Fungal fluorescence in H&E stained sections revealed organisms not appreciated on initial examination. Hettlich reported fluorescence of aspergillus in cytological specimens stained with the Papanicolaou stain . They noted that the technique was helpful in identifying morphologic features that distinguished aspergillus from other filamentous fungi. Mann reported that fungi could be easily identified at scanning power with the aid of a fluorescent microscope . I did not find this to be the case. Even strong fluorescence of dermatophytes was better noted on higher (at least 4X) magnification. Mann also noted that the technique was helpful when dealing with specimens with few organisms. I found this to be the case only in cases of dermatophytosis and protothecosis. Mann noted that two older cases of coccidiodomycosis and candidiasis showed little fluorescence. I found no correlation with the age of the specimen, and strong fluorescence was noted in 20 year old specimens. No fluorescence was noted in several specimens processed the same day. Mann noted fluorescence of histoplasmosis, aspergillosis and blastomycosis. These organisms did not demonstrate fluorescence in the present study. Graham reported that the technique was most helpful for identifying coccidioidomycosis, candidiasis and aspergillosis in solid parenchymal organs . The utility of the technique may be tissue-specific. 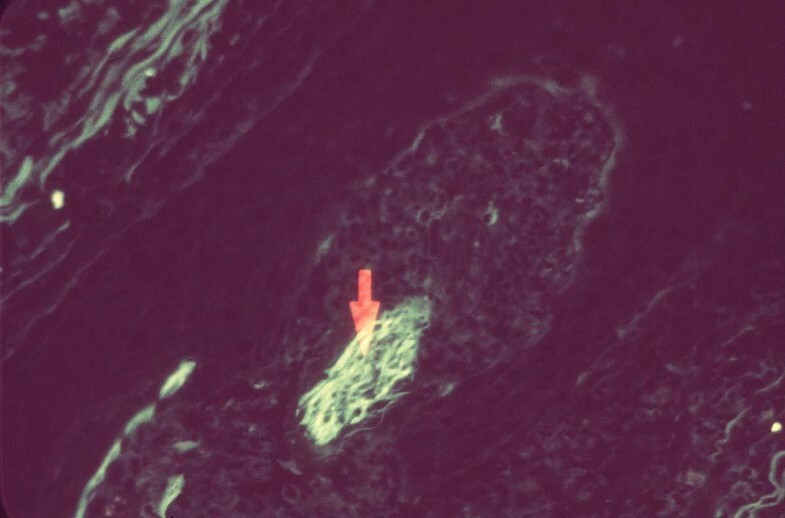 In skin, I did not find the technique helpful with these organisms, although even strong fluorescence of Candida would have been overshadowed by the bright fluorescence of the stratum. Graf noted that the wavelength of light, fixation method and mounting media influenced the fluorescence pattern of Candida albicans and aspergillus . With green excitation, acetone fixation resulted in strong fluorescence. Formalin, rather than acetone is standard for fixation of biopsy specimens, and although it is possible that some of the differences between the results of the present study and those of prior studies could result from subtle differences in mounting media, I believe this is unlikely. The slides examined were processed in 15 different laboratories over a span of years. No one lab demonstrated a greater incidence of fluorescence. 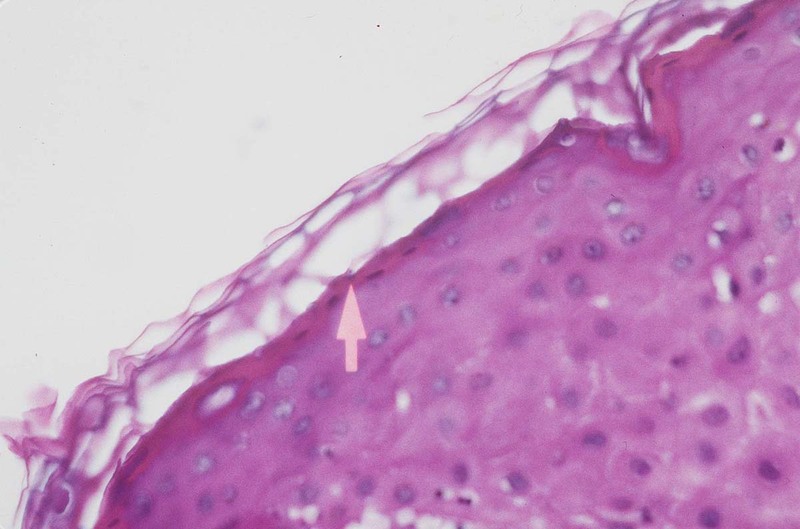 In summary, although prior reports suggested that fluorescence of H&E stained sections could be useful in cases of cutaneous fungal infection, the present study casts doubt on the utility of the technique. Fluorescence was often present, but was generally weak. 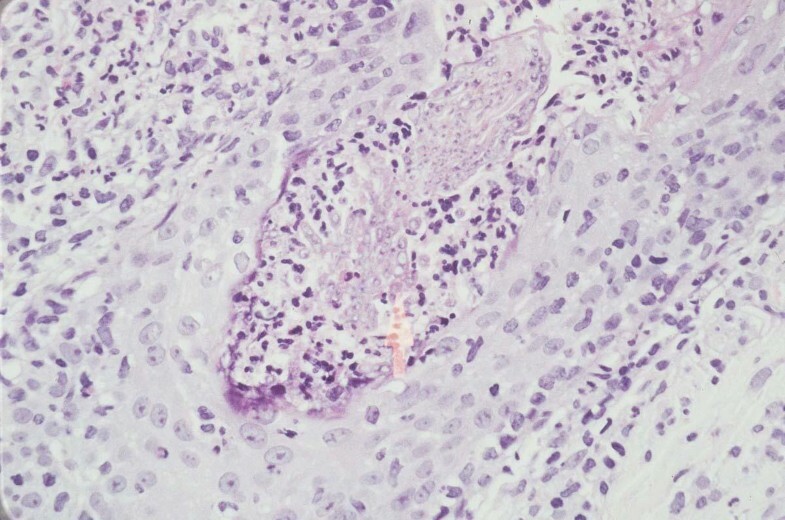 With the exception of a single case of fungal folliculitis, the technique was less sensitive than routine light microscopy in the setting of skin biopsy specimens. The views expressed are those of the author and are not to be construed as official or as representing those of the Army Medical Department or the Department of Defense. The author was a full time federal employee at the time this work was completed. It is in the public domain.